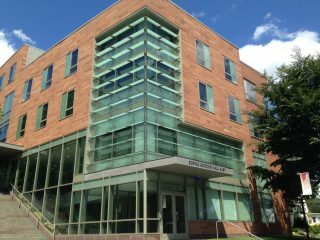 Sophia Gordon Hall (SGH) is Tufts' newest residential hall. Construction was completed in August 2006. SGH is 61,100 square feet and has 30 suites for 126 residents. It consists of two separate four-story buildings (East and West) connected by a corridor on the first floor. The majority of both buildings is made up of dormitory units, with individual living spaces grouped with a lounge, kitchen, and bathrooms. The first and second floor of the West building also houses a multi-purpose area which can be used as a theater or exhibit space. The first floor of both buildings, including the corridor connecting them, lies partially underground, and houses the laundry area, mechanical spaces, and storage areas. The first floor of the East building also houses common lounge and corridor areas as well as some dormitory area. The building has been designed to meet a set of stringent sustainable goals and is Tufts’ first building to be built to LEED standards. The LEED (Leadership in Energy and Environmental Design) Green Building Rating System® is a voluntary, consensus-based national standard for developing high-performance, sustainable buildings. Sophia Gordon Hall has received Gold certification from LEED . 30% Energy Use Reduction: The building's design optimizes energy performance to achieve a 30% reduction in overall energy use. 30% Water Use Reduction : Apartments, bathrooms and laundry have water efficient appliances, low-flow faucets, dual-flush toilets and a waterless urinal. Solar Thermal & Photovoltaic : Solar thermal and photovoltaic rooftop arrays provide hot water and generate electricity to minimize energy loads (funded by $500,000 from Massachusetts Technology Collaborative with matching funds from Tufts). Green Electricity : Tufts has purchased renewable energy certificates for Green-e certified wind power in an amount equivalent to the electricity needs of Sophia Gordon Hall and the new Music Center for two years. Improved Environmental Air Quality: The carpet and sheet vinyl adhesives, sealants and paints were chosen because they have very low or no VOC emissions. The building is non-smoking. Construction Waste Recycling: 75% of the waste from the building site was recycled or salvaged with a waste management program. Reduced Heat Island on Site : The white, Energy Star® roofing reflects heat away from the building and lowers the cooling demand for summer months, which also saves energy. 10% Recycled/Renewable Materials: 10% of the materials in the design contain post-consumer or post-industrial recycled content. New Glass Technologies: The Low-E insulated windows and the ceramic-fritted and louvered glass walls reflect heat away from the curtain wall in the summer months and reflect radiant heat indoors in the winter months. Sustainable Site Strategies: The landscape design maintains and adds to the existing natural shade. It also minimizes water use. Zero-cut-off site lighting eliminates the spillover of light into places where it is not needed. Storm-water Management: An underground storm-water retention system collects runoff from impervious surfaces and recharges it on-site, minimizing the load on the city's storm drains. Educational Displays: Signs and labels throughout the building educate users about Sophia Gordon Hall’s unique features. A screen showing real time monitoring of the building's energy use appears at the entrance. Our hope is that this building will be a model for living and learning at Tufts. The total site area of Sophia Gordon Hall is 50,000 square feet. 58% of the site (approximately 21,000 square feet) is pervious (i.e. water can penetrate directly into the soil). A number of catch basins, a Stormtech infiltration system and an underground detention Advanced Drainage System (ADS) reduce the rate of runoff into the city's storm sewer by maintaining or holding the water and releasing it slowly. No irrigation system has been installed for watering of the plants and grasses. The plants the designers have chosen are more drought-tolerant to accommodate the lack of irrigation on site. Plantings of trees will help to shade the pavement and building once the trees mature. These and the other plantings can also reduce the heat island effect . Erosion and sediment from building sites can have considerable ecological consequences. During construction, a comprehensive erosion and sedimentation (E&S) control plan required the project to keep sediment from entering nearby storm sewers by installing temporary silt fencing, placing silt fabric over catch basins, and sweeping the street carefully.